The state has tropical climate, characterized by high temperature, high humidity, medium to high rainfall and short and mild winters. As per Koppen’s climatic classifications most part of Odisha comes under the AW having a tropical Savannah type of climate. The south-west monsoon normally sets in between 5th June and 10th June in the coastal plain, and by 1st July the whole of the state is under the full sway of the south-west monsoons. By 15th October, the south-west monsoon withdraws completely from Odisha. These are the normal dates which fluctuate from year to year. As per “Thornthwaite’s classification”, Odisha comes under the “Sub humid” category, implying deficient winter rains. 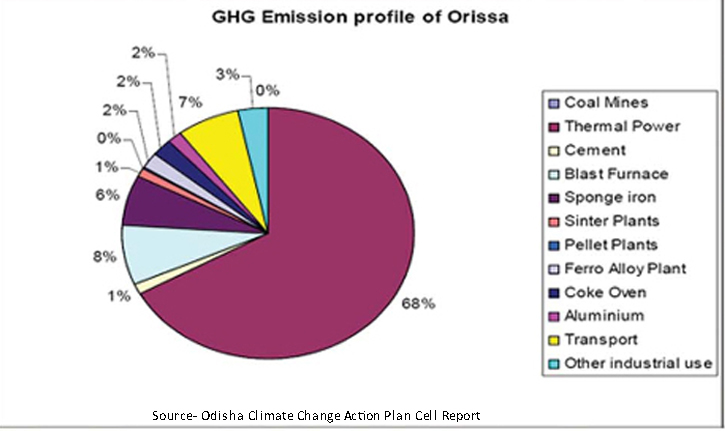 On the basis of climate type, Orissa has been divided into ten agro-climatic zone. The normal rainfall of the state is 1451.2 mm. About 75% to 80% of rainfall is received from June to September. Floods, droughts and cyclones occur almost every year varying intensity. Why Climate Change is a Serious Issue for Odisha? With a 480 km coast line that is prone to climate-mediated cyclones and coastal erosion and water resources dependent on monsoons, Orissa is relatively more vulnerable to climate change. Water-consuming rice is its main crop and therefore its agriculture is vulnerable to the vagaries of climate-induced weather changes. Though 38 percent of the state’s geographical area is recorded as forests, much of these forests are degraded. Vector-borne diseases, particularly malaria, are fairly rampant and climate change may make the prevalence of the disease even more widespread. infrastructure. All of these could affect the state’s economic growth and nullify the effectiveness of macro economic policies and pro poor initiatives. Climate projections for India suggest that impacts are likely to be varied and heterogeneous, with some regions experiencing more intense rainfall and flood risks, while others will encounter less rainfall and prolonged droughts. Among the more substantial effects is a projected spatial shift in the pattern of rainfall towards the already flood-prone coastal areas, while water-scarce regions become even more drought-prone and unproductive. India will also suffer from higher tides, more intense storms fueled by warmer oceans and further erosion along its coastline due to sea level rise. For India, climate variability and climate change pose huge risks to human life and threaten to endanger the sustainability of the country’s economic growth. 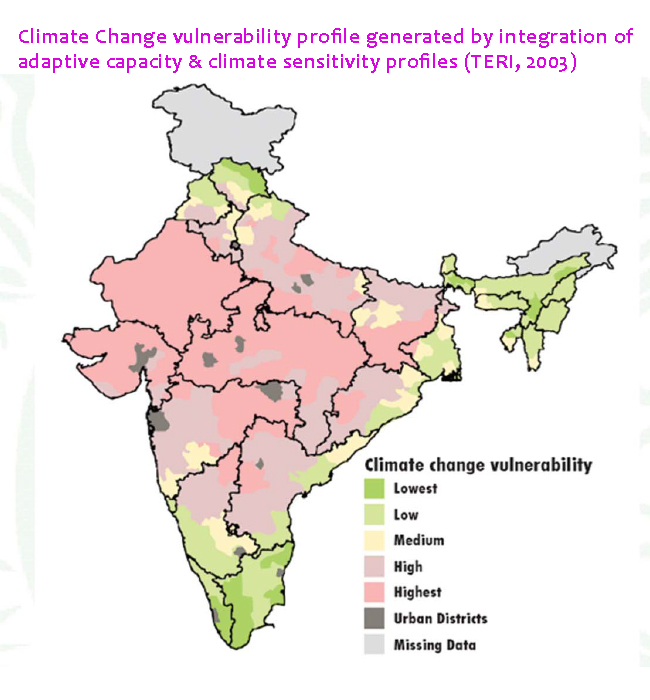 India’s immense geographic diversity adds to the complexity of developing and implementing an adaptation strategy. The impacts will vary across States, sectors, locations and populations. Consequently, there can be no one-size-fits-all approach to developing a climate risk management strategy: approaches will need to be tailored to address state and local vulnerabilities and conditions. Orissa has a 480 km vulnerable coast line, which is a periodic recipient of climate risks such as cyclones and coastal erosion. 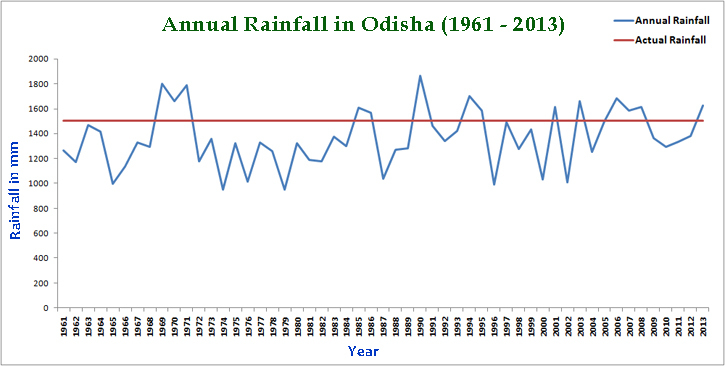 Orissa is rainfall dependent as its irrigation network does not cover the entire state. With a water-dependent crop, rice, as its main staple, the agriculture sector is vulnerable to the vagaries of climateinduced weather changes. In terms of health, the vector-borne disease - Malaria - is fairly rampant in many parts of the state. Although 38 percent of the state’s geographical areas are forests, much these forests are degraded. Orissa also remains one of India’s poorest states. The estimates from the Planning Commission reflected in indices such as the percentage of population below the poverty line both in rural and urban areas, and the overall incidence of poverty in Orissa vis-a-vis rest of India reveal that Orissa remains one of the poorest among all the major states of India. The high poverty in Orissa is closely tied to low productivity in agriculture, which is in turn linked to the prevalence of small and marginal holdings. The GoO has realized that poverty reducing economic growth would need acceleration of progress in both agriculture and non-agricultural sectors. Climate change is predicted to impede poverty alleviation programmes in Orissa both directly and indirectly compromising the current growth strategy. The direct impacts could include loss of life, livelihoods, assets, infrastructure, etc. from climatic extreme events. The indirect effects could be the effect on economic growth. 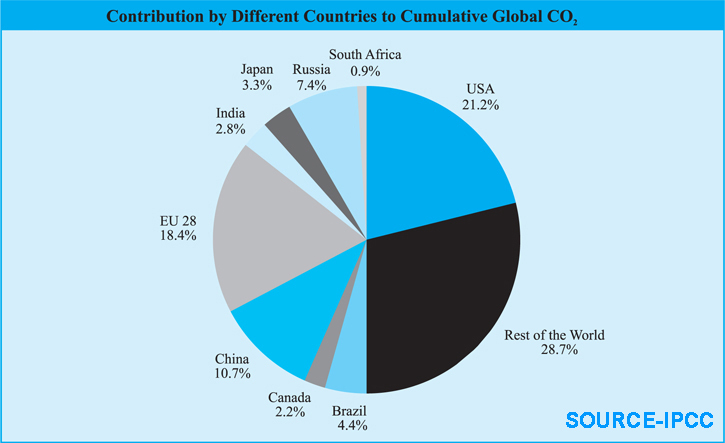 Continuing climate change variation is predicted to alter the sectoral origins of growth, including the ability of the poor to engage in the non-farm sector. This could nullify the pro-poor potential of macroeconomic policies, trade and private sector investment. Climatic variations could further multiply the vulnerability of poor people by adversely 30 Orissa Climate Change Action Plan affecting their health and livelihoods and jeopardizing growth opportunities vital for poverty reduction. Climate change in Orissa has the potential to tremendously aggravate water stress and enhance food insecurity.